Summary: Charlotte the rabbit loves to use science to solve her problems. Her biggest problem is that she is squished by her large family. So she tries the steps of the scientific method, first asking a question, then forming a hypothesis, and finally running a series of experiments. The first few fail, but she thinks she has found success when she builds a rocket and sends herself to the moon. In space, she has all the space she could want, and when she makes her observations and draws her conclusions, she decides that her hypothesis was correct. Being less squished has made her a better scientist! But then a new problem arises: Charlotte is lonely. So it’s back to the scientific method, and ultimately, back to earth, where she finally arrives at a solution that makes everyone happy. The last two pages review the scientific method in greater detail. 40 pages; ages 4-8. 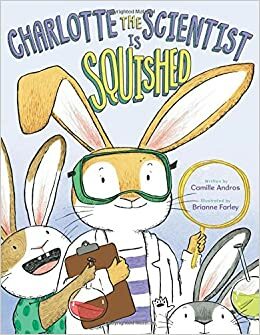 Pros: The engaging story and cute rabbits make an appealing introduction to the scientific method. Kids can even email Charlotte to tell her of their scientific successes. Cons: The word “hypothesis” is frequently used in the story, but isn’t defined until the last two pages.